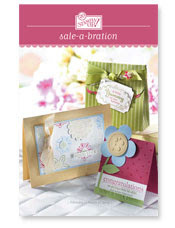 Sale-A-Bration is an AMAZING time in the Stampin' Up! year! From February 1 thru March 31, 2009 every time you purchase $50 in product (before shipping and tax), YOU get to select a Sale-A-Bration stamp set FREE!!! This can be done by individual orders, OR host a workshop and you earn even MORE benefits! That's not all! While supplies last, you'll also receive the Spring Summer Idea Book & Catalog ($10 value) FREE* when you place your order via my website. *To be eligible for the FREE Idea Book simply place an online order during the promotional period through my website, there is no minimum order amount required. NOTE: catalogs are available to the first 22,000 online company orders or until April 30, 2009, whichever comes first. Now is a GREAT time to join Stampin' Up!, not only will you get 15% off your kit, you'll also get to pick ANY stamp set (up to $47.95) FREE! You'll also receive 30% off your first order (in the first 45 days) and you can earn FREE SAB sets on that order. YOU customize your Starter Kit's stamp sets, ink pads & card stock! The kit has $335 worth of products for ONLY $169*! YOU get a 20% discount each time you order! You get a 30% discount on your first order over $150 within your first 45 days! COOL! You KEEP 20% instantly from all orders! You earn BONUSES for sales over $400 a month! The average STAMP CAMP/workshop is $350 nationwide. There is NO minimum due until June 30th. Easy! You don't have to do parties! The quarterly minimum is $300 in which YOUR personal orders count! If you don't meet that, you keep everything, no obligation! FREE stamps; FREE monthly magazine from SU! ; FREE web site access for demonstrator only sites, you can come to CONVENTION in Salt Lake City in August! Great Rewards are also DOLLAR for DOLLAR points we earn to cash in for more prizes with SU! You'll have my support! I don't know what you have to lose! You can also sign up online to be a demonstrator - email me for more information and my password so you can get started today!